#SOUTHWOLD VINTAGE SHOP SPY SPECIAL. This month my favourite vintage shop is the wonderful Cornucopia in Southwold. 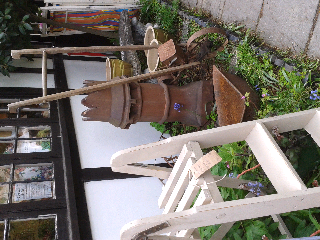 Set in a tranquil little spot, opposite the Adnams kitchen shop. Why we heart it? The owners are knowledgeable and friendly. With stock ranging from pretty ceramics, antique toys, beautiful linens, home and garden furniture. Price.. Very good, we bought two vintage deck chairs for £28.00 the pair. Good for.. If your looking for pieces to do up that won't break the bank. We Love.. True vintage and antique pieces only, no re-pro or tat.